Greensboro, NC – A significant new book on leadership education includes a chapter on “Developing Interdependent Leadership” by Charles J. Palus, John B. McGuire and Chris Ernst from the Center for Creative Leadership (CCL®), a top-ranked, global provider of leadership education and research. The Handbook for Teaching Leadership: Knowing, Doing, and Being draws on the expertise of leading international scholars and the insight of its editors: Scott Snook, Nitin Nohria and Rakesh Khurana — all leadership faculty at Harvard Business School. The chapter authors are also contributors to the ongoing Harvard Symposium on Teaching Leadership, a community of scholar-practitioners dedicated to sharing and understanding theory and best practices in the teaching and development of leadership. Four “practical arts” for developing the leadership needed to meet challenges that can only be solved by groups working collaboratively. Discussion of how interdependent leadership plays out at four levels: Society, Organization, Group and Individual (the SOGI model). An ontology of leadership based on the three essential leadership outcomes of shared direction, alignment and commitment. Real-world examples and simple, accessible tools to develop interdependent leadership while simultaneously doing the work of the organization. A framework for “putting it all together,” including five steps that build toward interdependent leadership at the organizational level. 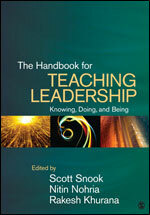 The Handbook for Teaching Leadership presents an assessment of the current state of leadership education, establishes a foundational reference for teaching leadership, and builds a respected community of practice to provide serious scholarship on leadership and how to teach it, according to the publisher.